We’re at the 78 mile marker (as you can see) now, at the natural portal of Bald Knob tunnel. The tunnel centers at 36.6666080, -82.750432 at about 1400′ elevation. 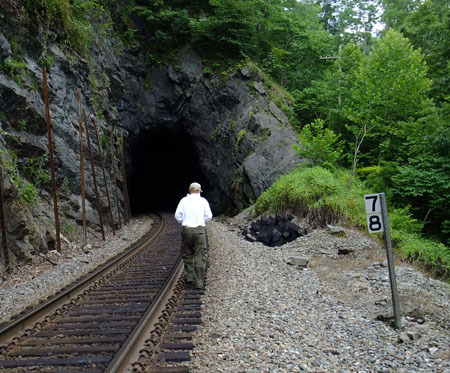 It’s 453′ long and is about 1900′ southwest of Clinchport tunnel. While the former Clinchfield line bored through Bald Knob, the N&S (old Southern) ran their line closer to the Clinch River and avoided having to tunnel. I speculate that the unusual configuration of the rock, the near vertical face on the left) around the tunnel entrance precluded finishing it off with concrete. This is looking roughly south.